If there is ever a mindless purchase that most men grab due to sheer convenience, it’s the nail clipper. 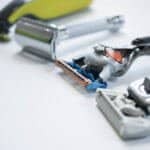 Found at the local drugstore, gas stations, or even hotel gift shops – with exception to the disposable razor, nail clippers are probably one of the most widely accessible grooming tools. 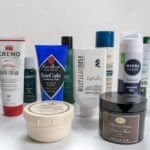 But given its wide distribution on store shelves everywhere – this oft grooming tool can make a world of difference on the overall appearance of your hands and feet. 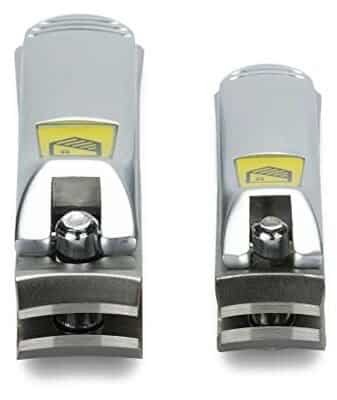 The super sleek, Japanese made Seki Edge are among the top-rated fingernail clippers on the market. Seki Edge is crafted with a twice tempered stainless steel edge and cast-iron, super strong lever for a precise and clean cut. The stylish and ergonomic design has a solid grip that allows for smooth and easy clipping, so even the thickest nails are trimmed and shaped with very little effort. 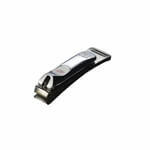 This is one of the best reviewed clippers available and they stand at a very modest price point especially considering the quality of the product and its nearly flawless feedback. 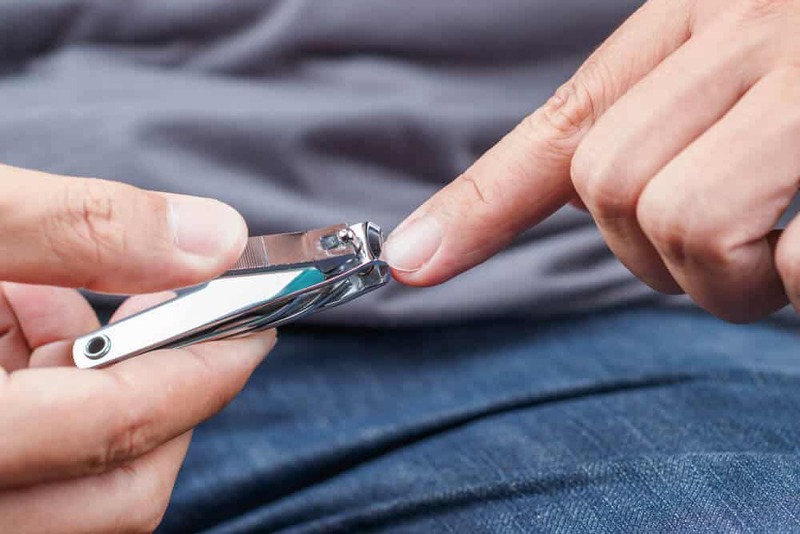 You’ll probably never need another pair of fingernail clippers after you bring home Seki Edge. 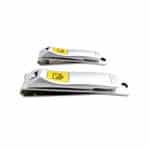 Harperton Nail Clipper Set is one of the top-rated cuticle tools because of its fantastic, quality design and satisfaction guarantee. Harperton’s refined design is crafted from strong, surgical grade stainless steel and the set has different sizes so you can easy clip even the thickest nails on either hand or foot without risking the spread of fungus or infection between the two. Harperton gets top-notch reviews not only for their fantastic set and quality of design, but they also stand by their product with a 30-day satisfaction guarantee and a lifetime warrantee. If you are looking for a one-stop shop on total nail care Harperton’s set will delight. 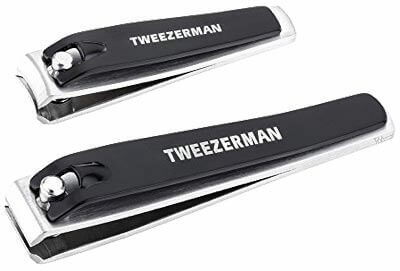 The aptly-named Tweezerman Deluxe are born from the J.A. Henckels group famous for their sharp cutting knives – see the correlation? 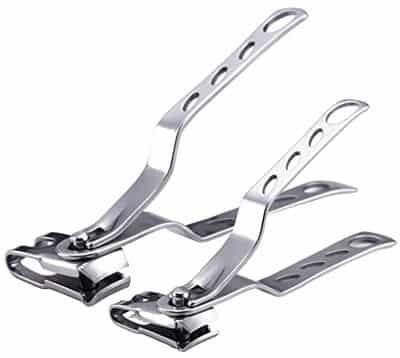 Tweezerman’s set comes with two pairs – one for fingernails, one for toe nails – that each have unique design. 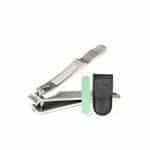 The fingernail clippers are curved to cut and shape, while the toenail trimmers are straight to cut your typically thicker toenails with ease; both are strong and made of stainless steel. The sleek looking set has an engraved Tweezerman logo and is very affordable – in fact, this is probably the best for your money if you are looking for a set. 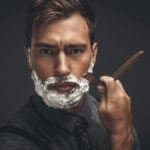 Grooming District’s Premium clipper set is one of the best for your money because you get so much for such a great price. Great for travel, you get a handy case, nail file, emery board (for filing of sharp edges), and, of course, a nail clipper suitable for both fingers and toes. The sleek design is crafted with tempered stainless steel and matte finish to reduce slip. The size of the clipper and strength of the blade is beneficial for cutting thick blades. The clippers can be shared with the ladies as well who may want to use it on tougher nails or shape their acrylic nails with the emery board. Keiby Citom’s nail clippers bring to the table a very unique and useful design with a 360-degree rotating head that gives the ultimate in precise trimming. The beauty of the smart 360-degree head is that it sways easily as you need to turn on a rounded nail or trim sharp edges in tight spaces. In addition, the design holds well without slippage and because you can turn so easily you’ll have optimal leverage. 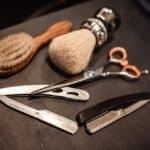 The stainless steel, easy-use clippers are not only a quality product, but the super affordable set is also backed with a 30-day money back guarantee. 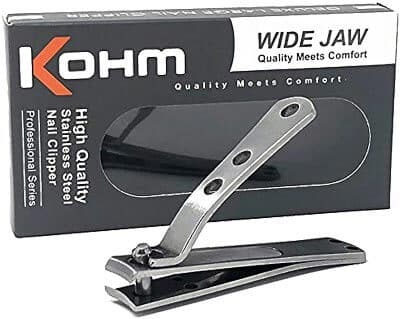 Kohm Large Nail clipper is just that, a large nail clipper, in the sense that it is bigger in size than the competition and has a wide handle for easy grip and action. The beauty of the large design is that you can clip and shape with ease, yet not run the risk of tearing or splitting the nail. The brushed stainless steel design gives it a modern look and the ergonomic design helps you work less and cut with simple precision. 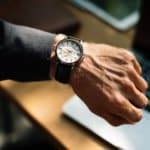 The folks at Kohm built their product to last and they stand behind that idea with a satisfaction guarantee. 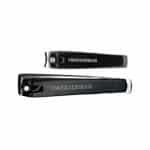 Mehaz 668 is the top-notch toenail clipper for clipping and manicuring thick nails. 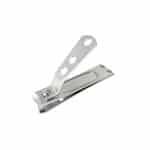 The wide-jawed toenail clipper is a straight blade, neatly set at an angle that will make shaping and cutting on corners a snap. There is a built-in file to smooth out edges and a nifty clippings catcher to help corral those pesky nail clips from going all over. Mehaz 668 is ambidextrous as well, which is important for an angled clipper; simply adjust the handle if you are right or left handed and trim away. Like their most of their stout competitors, Mehaz backs their product with a lifetime guarantee. I think we all know the Swiss-army knife famous Victorinox brand by now. The trusted and highly reviewed brand known for their handy knife tool, naturally, have a top-rated nail clipper as well. Sleek, light and compact the Victorinox clippers are compact and travel-friendly as they also come with a leather case to take on the road. 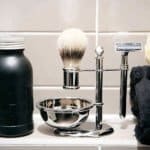 The stainless steel design is sturdy and well-designed for precise trimming and also comes with a nail file to soften or shape sharp edges. 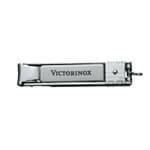 With a modest price point, compact design and a trusted name, Victorinox remains a popular choice for nail grooming. Vaulua Nail Clippers are not only great for the money, but the industrial looking, brushed stainless steel, and wide-back handle are super friendly on grip and cutting precision. The clippers are super sharp and will cut through even thicker nails with ease and without the risk of ripping or tearing. Beyond grip and precision, ergonomics come into play with a nifty rotating hinge and handle that lock and allow for great leverage. The price is just fantastic for such a nice set of clippers and the people at Vaulua not only offer the great price, but they stand behind it with a lifetime warranty. E Z Grip Scissor Like Nail Clippers are shaped like a standard nail clipper, but the lever and handle both have a circular, scissor-like handle so you can grip with ease and trim nails as if you were using a pair of scissors. 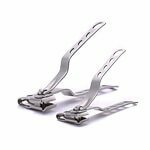 The two piece, chrome-plated steel set has two sizes so that you can get after finger and toe nails, plus you’ll love the easy grip. The clever design is highly reviewed and well-liked especially by those with arthritis because you need very little finger strength to operate them. Besides that, you get a get set at a seriously affordable bargain. 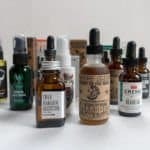 For any of the cheap nail clippers that you buy for only a couple of bucks – they are largely comprised of a nickel-plated body. This design, while it looks great on store shelves, just simply isn’t one that will last you for years. 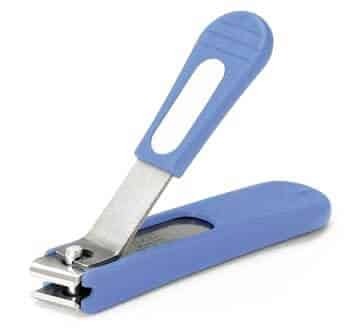 The biggest fallacy of the nickel-plated clippers is that once they are dropped a few times the coating begins to crack exposing its inner body to the elements. Naturally when steel is exposed to water it will begin to oxidize and eventually rust will inevitably form. The last thing you need to be worrying about is if your tetanus shot is up to date when simply cleaning up your finger or toe nails! 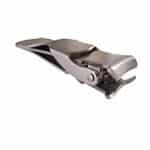 Therefore, what we like to recommend for men everywhere is to rely on nail clippers that are fully 100% stainless steel. A full-bodied stainless steel design will never rust nor is it susceptible to mold growth – therefore it’s all but guaranteed to last you for several years. Just as a quick note: I see a lot of men keep their nail clippers on their key chain for easy access. While this may be incredibly convenient, just remember if the clippers have a nickel-plated body they will likely deteriorate quicker due to them constantly hitting the keys on your keychain when simply walking or tossing them on the counter. Beyond body construction one of the key components to any nail clipper of course will be the cutting edge. 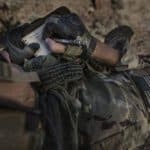 What sets the nail clippers listed above apart from the inferior clippers found at bargain prices will be the sharpness and precision of the blade. 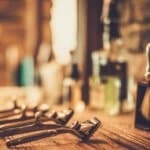 When deciding on the best nail clipper for you, you will want one that has both top and bottom blades that line up perfectly in order to get a clean cut on your nail. The biggest sign of a cheap or well-worn nail clipper will be tearing of your nail when you cut it. 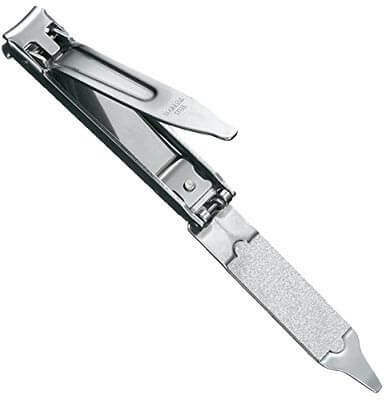 A finger nail clipper should enact a slicing motion when the top lever is pressed down. A quality nail clipper should never pull or smoosh your nail when cutting. Secondly, a top-rated nail clipper won’t leave those pesky little nubs near your cuticles on the edge of your nail (especially your toe nails). Instead it should be able to cut those little nubs clean off. 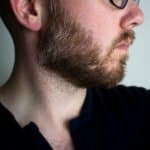 You Can Use Finger and Toe Nail Clippers Interchangeably – But Should You? You go to your bathroom, look in the medicine cabinet and only find the toe nail clippers. 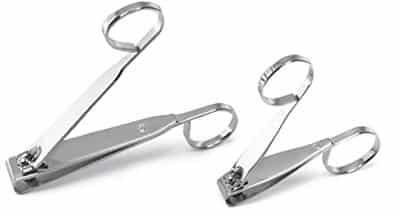 You think for about 2.3 seconds on whether you should try to find your finger nail clippers. You decide to just simply wing it – besides what’s the worst that could happen?? Well not a whole lot – but finger and toe nail clippers are two very distinct tools. 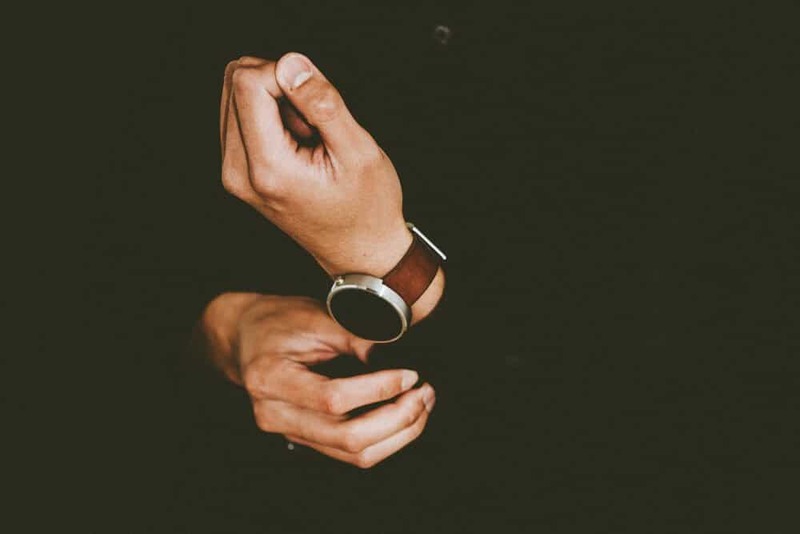 First and foremost, nail clippers for your hands will generally be a bit smaller than those designed for your toes. The reason for the difference largely has to do with the size and thickness of your finger nails compared to your toes. 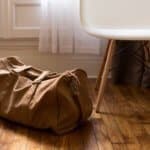 As you would likely guess– your toe nails will be thicker and subsequently requires a larger tool to cut them. 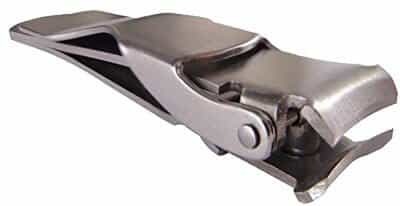 The larger handle on a toe nail clipper achieves this leverage making it much easier to cut the nail. 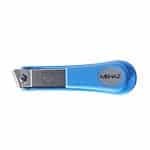 Conversely you can of course use a toe nail clipper on your hand – however the oversized head coupled with the cutting power makes it hard and somewhat dangerous when cutting nails that are pressed against your cuticles. Simply put, it’s hard to get a close cut on your finger nails with a toe nail clipper. 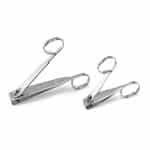 Now you could use a finger nail clipper on your toes, however it will require much more effort that may lead to slippage on the handle. Secondly, given the thickness of your toe nails, using an undersized clipper may shorten the life span of the blade by making it dull. Size aside, one of the large distinct qualities between these two tools is the shape of the cutting head. Finger nail clippers will have a curved edge that allow you to navigate around the edge of your nail with relative ease. 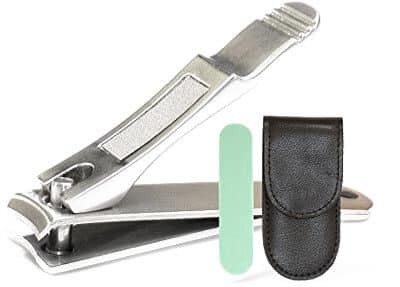 Toe nail clippers tend to have a completely flat edge (or at the very least a shallow curve) to account for the natural slight curve of your toe nails. If your toe nails tend to have more of a curved shape to them, you should be able to find a toe nail clipper like the Haperton. Finding the perfect nail clipper to slice effortlessly through even the most stubborn of fingernails is tough. However, after several hours of research, testing, and other reviews, we think we found the best nail clippers of 2019.